As you get older you tend to have more responsibilities, so carving out the time for an unknown event like this wasn’t on the top of either of our lists. We had decided to check in with each other that morning to decide if we felt like meeting up later that afternoon. In the meantime, we both checked online to see if any of our friends were planning on attending. The response was fairly underwhelming, as my friends who do attend sci-fi conventions are probably saving up for the expense of Dragon Con, which is only six weeks further down the calendar. Also: it’s summer. People be busy. We touched base on Saturday morning and agreed to meet downtown late in the afternoon. I encountered a flash flood on my way into town so my arrival at Trader Vic’s was pushed until nearly 7 o’clock. The bartenders at Trader Vic’s make me special tiki drinks that can’t be found anywhere on the menu. My current favorite is Captain Drew’s Chinese Stinky, which is quite different from a Belgian Stinky or a Toledo Stinky (which should never appear on any menu, ever). Those tiki drinks are sugar bombs, but we were preparing to burn some calories on our long hike over to the Georgia World Congress Center, so we kind of had to drink them for our own safety. Being old convention pros (and old middle-aged men, neither of whom had eaten lunch) Shawn and I decided to grab dinner at a restaurant that we and our friends have come to enjoy a lot. We like the place so much that I am not even going to mention its name because they do not need any additional business. It was such a popular establishment that evening that we were informed it would be a 30+ minute wait to get a table (AmericasMart was hosting its big July show that same weekend and the restaurant was full of tequila-filled shoppers). Remembering our original mission we thanked the host and hostess and headed in the direction of the convention center, keeping an eye out for places to eat along the way. Sure, my love of comics got me flown to London in my early 20s to be in the first modern Batman movie, but that wasn’t about to put dinner in my belly, and as Shawn informed me: he had mowed two yards that day and was extra hungry. By 7:30pm we had only made it as far as the CNN Center, and according to Shawn this stupid convention closed at Midnight. Dragon Con, we agreed, could last for 5 or 6 days (if you do it right) and it never really closes. It’s like the Olympic Flame of Nerddom. We kept walking but Shawn was making it clear that he would need to eat soon; his declarations of hunger were beginning to arrive with an alarming regularity. I stopped walking. The look on my face was probably a good indication that I had not checked the badge prices before heading downtown. The complicated adult-style words tumbling out of my mouth must have been funny because Shawn chuckled and said “Maybe they’ll just let us go in for free!” and continued walking toward the entrance muttering “Man, I sure am hungry” under his breath. The Georgia World Congress Center is so big that it can host multiple large conventions simultaneously. On Saturday they were hosting the Atlanta Comic Con, a car and bike (as in motorcycle) show hosted by radio station V-103, and some sort of Indian event that I can’t seem to find information about anywhere. It might have been a wedding, a fashion show, or an Indian-themed science fiction show. That would have been worth $47 to attend. As we walked toward Building “A” a pleasant young woman called out “Going to the bike show? It’s this way!” and swept her arm in the direction of a cavernous hallway. We must have looked more like fat old bikers to her than husky middle-aged nerds. On some level I took that as a compliment. Shawn asked her for directions to “The Comic Con”. I might have seen a glimmer of sadness in her eyes, but she gathered a smile and pointed off behind us. Comic Con was in Building “C”, a quarter mile walk (on cement) in the opposite direction. Time was ticking so we walked briskly through the complex, which is surely larger than many airplane terminals. Shawn stared longingly as we passed a “flexible eatery concept” stocked with institutional food. He talked about the merits of Papa John’s pizza as we hoofed it toward the hall housing the registration line, finally arriving around 7:45pm. The line was as empty as our stomachs, particularly Shawn’s. Did I mention that he had mowed two lawns that day? We had the good fortune to run into James, who is known for his convention photography. A very pretty cosplayer he was with provided us with her insight into this new con, the majority of which was both positive and realistic. Comparing the ATLCC (can we call it that? I’m getting tired of typing it out) to DragonCon is inevitable, especially with Dragon only six weeks away. Like many smaller comic conventions, the ATLCC is largely devoted to the consumption of physical products and entertainment, which translates to a big dealer’s room and several panels during the day. By 7pm the dealer’s room is closed and by midnight the whole place shuts down, just like a trade show. If it’s Atlanta, people are going to Cosplay. Few large conventions are like DragonCon, where the attendees essentially live inside the convention for its duration. The convention hotels are hopping every hour of the day – when the official programming ends the unofficial programming and partying carry through until the break of dawn. DragonCon cosplayers essentially sleep inside of glorified changing rooms, packed full of luggage with all the costumes they plan to roll out over the course of the event – and some of those costumes can be a bit revealing. Which is why, as Shawn pointed out between suggestions about places to eat, ATLCC isn’t trying to be DragonCon. It’s a kid-friendly convention. It’s just a jumbo sized comic book show like you find at smaller venues around town from time time to time. The organizers know their audience, and it’s different from DragonCon. The Atlanta Comic Con is a “consumpticon”. And people, especially young people, are all about consumpticons – they’re at the right age for collecting artifacts and ideas. It’s a very exciting time of life and a fun event for families to experience together, even if it turns out that they’re not destined to become mega nerds like some of us. Friends of friends on Facebook who had operated booths at ATLCC indicated that their sales had been strong enough to justify returning next year. Shawn noted that even though we were seeing the place in its “closing up” phase of the day, when most of the crowds had abated, there were still more than a few families walking around. As we are accustomed to the parking options around the DragonCon area of downtown Atlanta we found the parking around the stadium to be an unknown, so Shawn took an Uber into town from his house and I parked in a familiar spot over in DragonCon territory. Shawn felt that the location wasn’t “great”, but to be fair it’s about the only space downtown that can operate as a swing space for that many people for a short-lived event. The very next day Shawn and his wife attended the Atlanta United soccer game (in the Mercedes Benz stadium, next door) and he spotted a MARTA station right next to the Building “C” entrance, so public transportation is a great option for ATLCC (people who attend MomoCon in the spring must know all of this information already). Both of us had friends who posted photos from inside the event hall and from what we could observe it sure seemed a lot roomier than Dragon Con’s dealer’s space at AmericasMart, which is spread between several floors. To be fair, it may have appeared that there was more space at ATLCC simply because there were fewer vendors – who knows? Shawn felt the badge price was too high for a first year event, but I’m betting that the admission price is comparable to an auto show at the same facility, and many of the attendees I saw walking around were clearly newcomers to the convention scene – they had no basis to form an opinion on fair prices. This was a punctuated event for them, not a lifestyle. Maybe trade shows to the public don’t worry about repeat business. One of Shawn’s final observations was really on target – it didn’t feel like a con from the outside. There wasn’t a lot of signage and there were precious few cosplayers to be seen on the Omni side of the Georgia World Congress Center. Maybe it was different for people driving along North Avenue (which is, by the way, full of assholes with glasspack mufflers trying to show off to each other). Conversely, DragonCon has an embarrassment of cosplayers falling out into the street and the city looks forward to watching its geeks return near the end of summer. 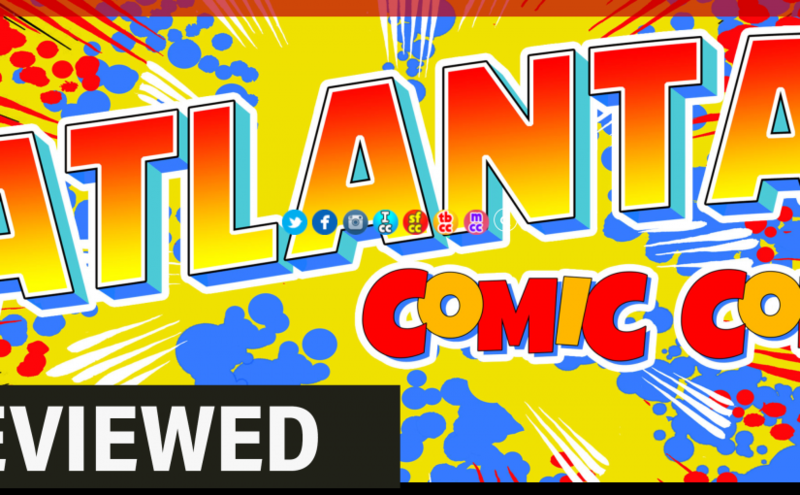 The ATLCC isn’t a convention – it’s a comic book trade show with celebrity guests. It isn’t (currently) competition for DragonCon and it’s highly unlikely to ever pose a threat. As a matter of fact, its biggest obstacle may be something altogether different than industry rivalry, it’s far likelier to be parking. The Georgia World Congress Center’s proximity to the Mercedes Benz stadium may be problematic on game days, especially since Atlanta United is pulling in record numbers of fans now. Maybe there’s enough parking to handle both facilities with room to spare, but I can’t help but wonder how many potential con attendees opted not to fight game day traffic on Sunday. In case anyone is worried, Shawn did eventually get to eat. We didn’t buy badges to ATLCC. Instead, we headed back to the super secret restaurant where we were once again informed that we faced a 30 minute wait. We eventually found ourselves at a place where ladies in short shorts serve chicken wings and beer. We had plenty of time to discuss everything we had seen that night. Because it took them an hour to bring us our food. You are pretty much on the ball with ATLCC being a comic book trade show. It is run by Imaginarium, and they’ve been starting to explore more places in the country. I used to go to their Tampa Bay CC, which is a lot different than you mention in their review (I would say they are the Momocon of Tampa, but it’s in Tampa), but I assume ATLCC is trying to get to become known here, but failed because they’re just hopping cities. Rent the venue, get celebrities, and bank off vendor space and audience. There’s nothing about it that makes one feel like they are in Atlanta like Dragon and Momocon do. You aren’t the only person disappointed, and I sure wouldn’t have paid $47 for that. Maybe $30. I got in for free helping a vendor friend. I usually like to visit the local cons to meet local artists, but this was a failure to me, IMO. I would rank it in the same tier as Momocon, but it’s not a threat to Momocon, thats like Dragoncon’s younger sibling.